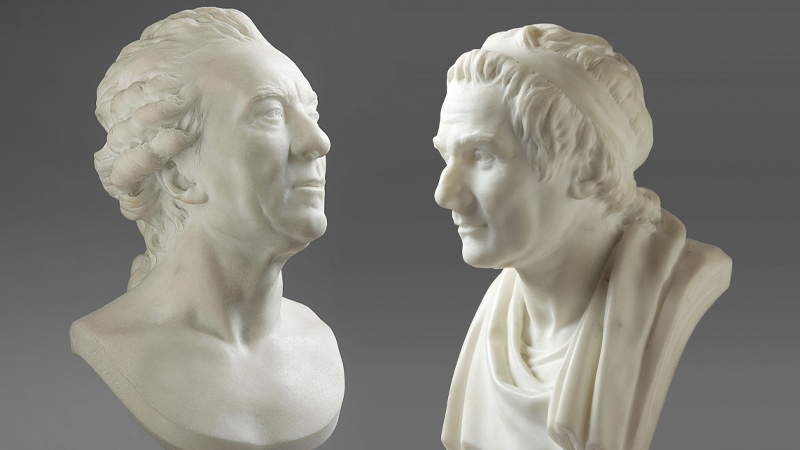 A pair of marble busts by French sculptor Jean-Antoine Houdon soar to a combined $1.475 million at Cottone Auction. Two rediscovered marble busts by the French 18th century sculptor Jean-Antoine Houdon (French, Versailles 1741-1828 Paris) sold for a combined $1.475 million at the Fine Art & Antiques Auction held March 23rd by Cottone Auctions, online and in the firm’s gallery. The busts were the top achievers in an auction that featured just over 300 lots, totaling over $3 million in sales. Two rediscovered marble busts by the French 18th century sculptor Jean-Antoine Houdon (French, Versailles 1741-1828 Paris), purchased by a European phone bidder ($1.475 million). Both busts were recorded in the Frick Collection Art Reference Library in New York in 1932 and had been passed down through the descendants of the Honorable Irwin Boyle Laughlin (1871-1941), an American diplomat serving in the State Department from 1903-1932 who acquired them in 1926 from the Paris dealer Paul Gouvert. They were rediscovered, remarkably, at an estate in Geneseo, where Cottone is based. The busts had been previously overlooked in a 2000 estate appraisal by an auction house in New York. 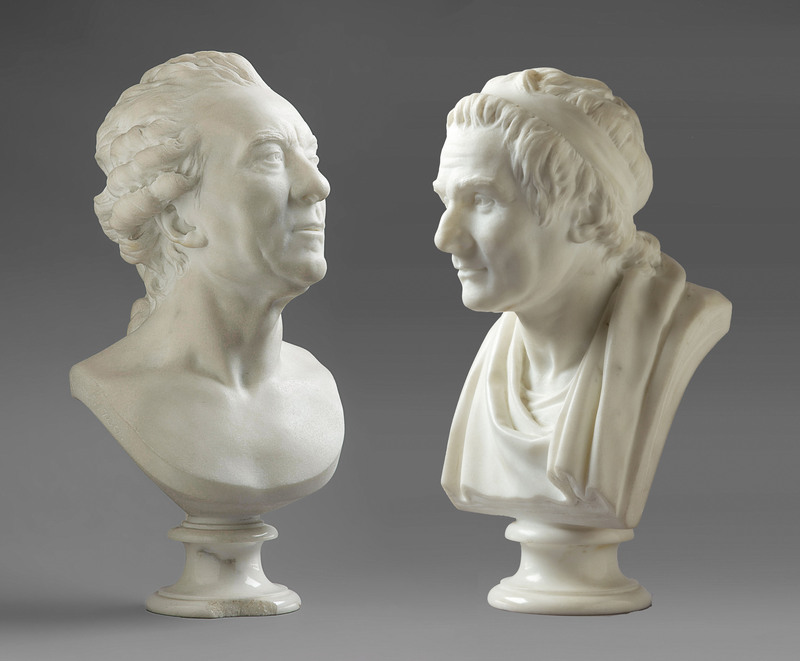 The busts, reductions in Serevezza marble, represent Jean-Jacques Rousseau (which gaveled for $778,800) and Georges Louis Leclerc, Comte de Buffon (which brought $696,200. They stood 11 and 11 ½ inches in height, respectively, including the socle. Each was signed and dated (one 1788, the other 1789) and both are recorded as having been exhibited at the Paris Salon of 1789. "Aux portraits que tu en fais, je les reconnais ces charmants modéles... nos sublimes J. J. Rousseau et Buffon." The busts were catalogued in-house by Michael Parsons. Laughlin formed an extensive collection of French eighteenth century drawings while ambassador to Spain, with help from Agnews Gallery, London. The collection was of outstanding quality, and included over three hundred drawings by Fragonard alone. 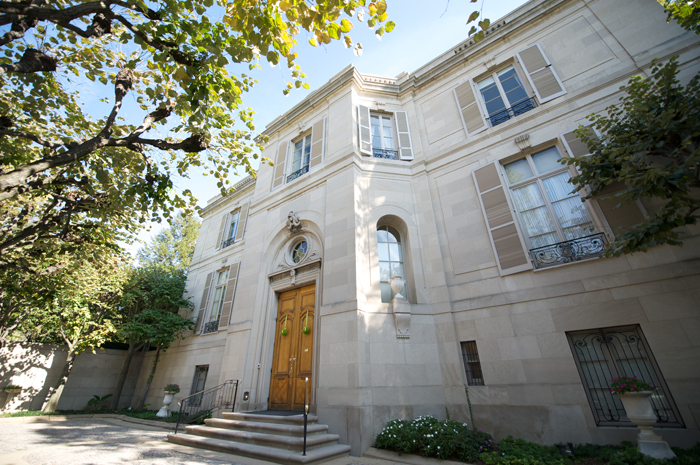 Laughlin built his home in Washington, The Meridian House, by John Russell Pope, in the Louis XVI style, and assisted in the planning of the West Building of the National Gallery of Art. 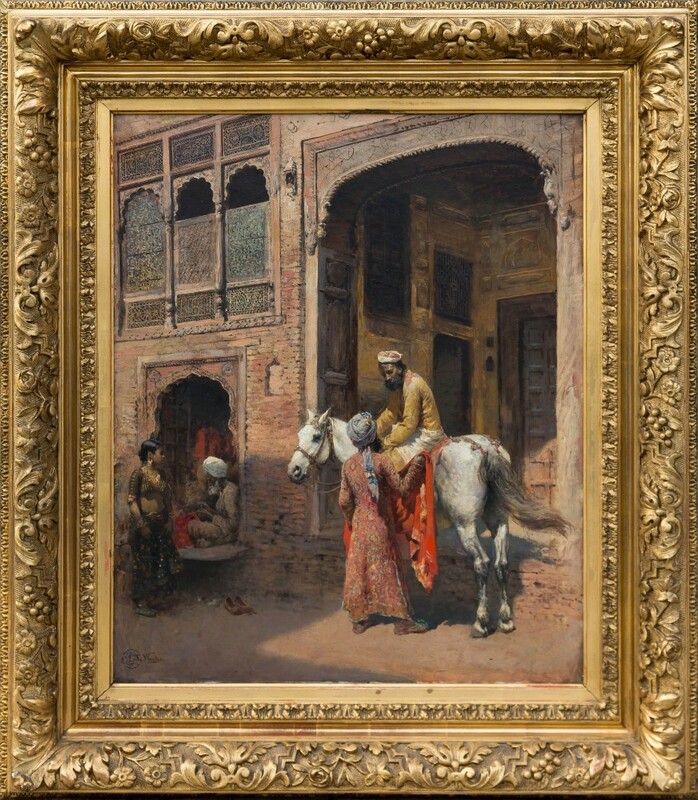 The auction overall featured fine art, Tiffany lamps, 20th Century Art and design (which was sold on behalf of the David Anderson Grandchildren’s Trust in Buffalo, New York, as well as fine decorative arts, furniture and Asian objects. For those unable to attend the sale in person, online bidding was offered by LiveAuctioneers.com, Invaluable.com and the Cottone Auctions website. Rare set of nine Chinese blue and white Eight Immortals bowls, each one 2 inches tall and 4 ¼ inches in diameter and carrying the 6-character Daoguang character reign mark ($118,000). One other lot reached the six figures. It was a rare set of nine Chinese blue and white Eight Immortals bowls, each one 2 inches tall and 4 ¼ inches in diameter and carrying the 6-character Daoguang character reign mark (1821-1850). The bowls were decorated with the eight immortals in clouds over swirling waves, with the center interior depicting the three star gods ($118,000). Outdoor figural oil on canvas rendering by Edwin Lord Weeks (American, 1849-1903), 24 inches by 20 inches in a gold gilt frame and signed “E. L. Weeks” lower left ($82,600). Oil on canvas winter landscape by John Fabian Carlson (Swedish/American, 1875-1947), signed, 30 inches by 40 inches in the original frame ($22,400). Staying with fine art, an oil on mahogany panel depiction of a man in a hat by the Filipino artist Fernando Cueto Amorsolo (1892-1972), done in 1927, signed and 16 inches by 13 inches, made $26,000. 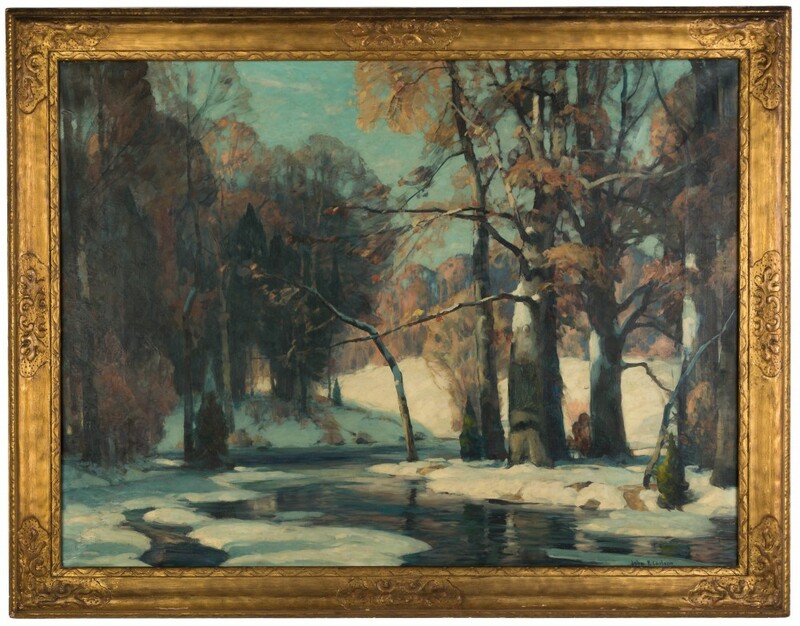 Also, an oil on canvas winter landscape by John Fabian Carlson (Swedish/American, 1875-1947), signed, 30 inches by 40 inches in the original frame, changed hands for $22,400. Several beautiful Tiffany Studios (N.Y.) lamps illuminated the room before finding new buyers. They included this gorgeous Bamboo table lamp ($85,500). 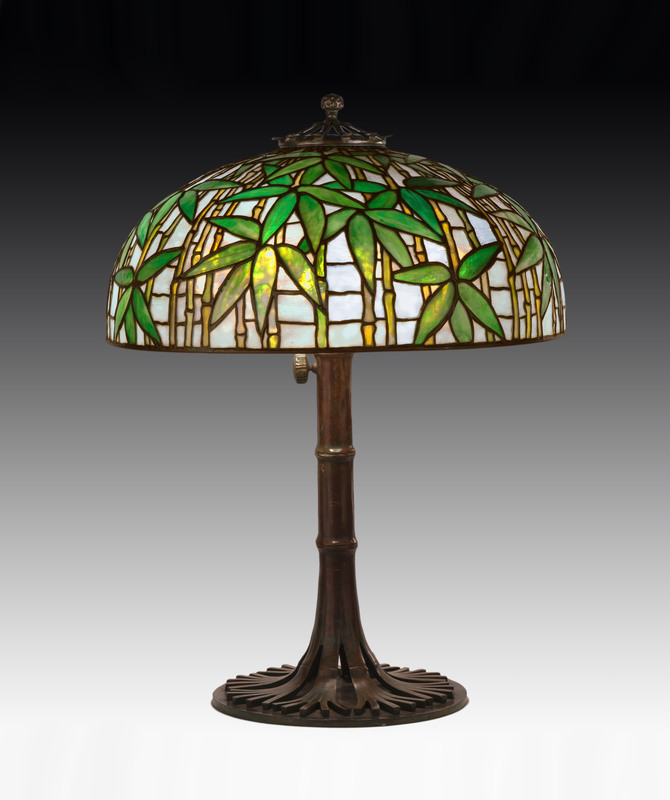 Several beautiful Tiffany Studios (N.Y.) lamps illuminated the room before finding new buyers. They included a Bamboo table lamp, ($85,500); a leaded glass and patinated bronze Arrowroot table lamp with a 14 inch shade ($62,500); and a Turtleback table lamp, ($44,800). 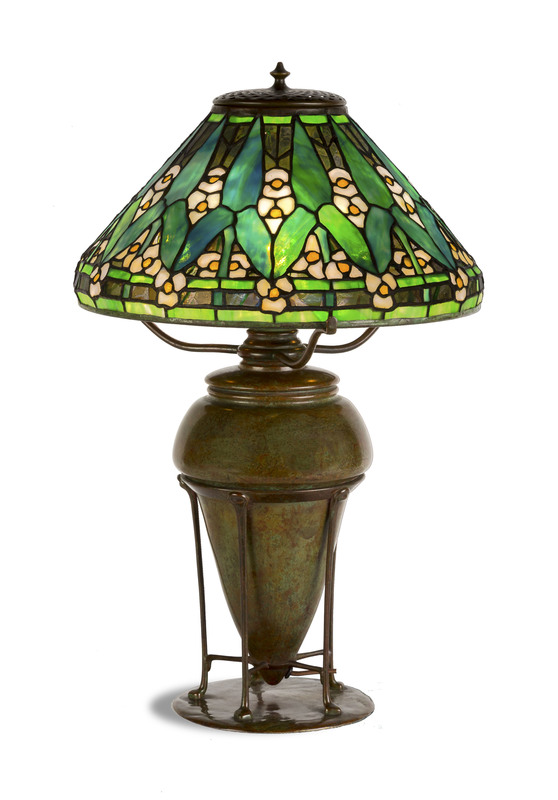 Tiffany Studios (N.Y.) leaded glass and patinated bronze Arrowroot table lamp with a 14 inch shade ($62,500). 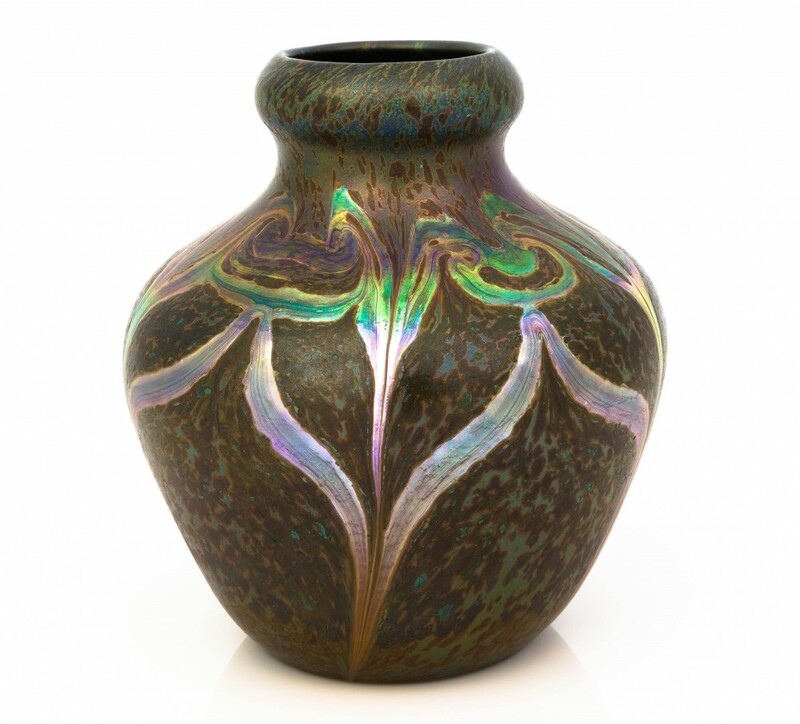 Other outstanding Tiffany Studios creations also came up for bid, like the fine and rare decorated Cypriote vase, manufactured circa 1899, 9 inches tall, with the rough surface textures resembling the decomposed surfaces of Roman glass buried for centuries ($36,600); and the circa-1910 side table, boasting a brownish-green patina and handsomely made from quarter-sawn oak ($31,800). Tiffany Studios (N.Y.) decorated Cypriote vase, circa 1899, 9 inches tall, with the rough surface textures resembling the decomposed surfaces of Roman glass buried for centuries ($36,600). Also sold were a Steinway Model B piano with ebony veneer, ($35,500); a late 19th century Serapi rug measuring 12 feet by 10 feet ($17,100); and a rare Steuben Aurene & Millefiori decorated vase, 14 inches tall, decorated with leaf and vines and a ruffled top and signed “Aurene Haviland”. The vase hammered for $6,500. Rare Steuben Aurene & Millefiori decorated vase, 14 inches tall, decorated with leaf and vines and a ruffled top and signed “Aurene Haviland” ($6,500). Next up for Cottone Auctions is an Art & Antiques Auction slated for Saturday, May 18th, also online and in the Geneseo gallery. Already consigned is a rare “Theo A. Kochs” (Chicago) salesman’s sample barber chair.